Considering that we are celebrating the 50th anniversary of Apollo, and that NASA has contracted with Firefly Aerospace and Intuitive Machines to provide new lander vehicles, I thought you all might enjoy this article I wrote that was originally published in Ad Astra in 2013. Every year at space conference parties, enthusiasts have pondered the question: If we flew an Apollo mission to the Moon with today’s technology, how would it be different? One enthusiast, five-time shuttle astronaut Jeff Hoffman, PhD, who is now a professor at MIT, assigned a couple of graduate students to find a definitive answer. The students, Alex Buck and Austin Nicholas, presented their findings at the Brown University-Vernadsky Institute-MIT Microsymposium 54 held the Sunday before the annual Lunar and Planetary Science Conference in Houston in March 2013. Though Dr. Hoffman wasn’t able to attend (he answered questions via telecom), Apollo 15 Moonwalker Dave Scott was present to enthusiastically endorse their work and encourage the space community to act on it. 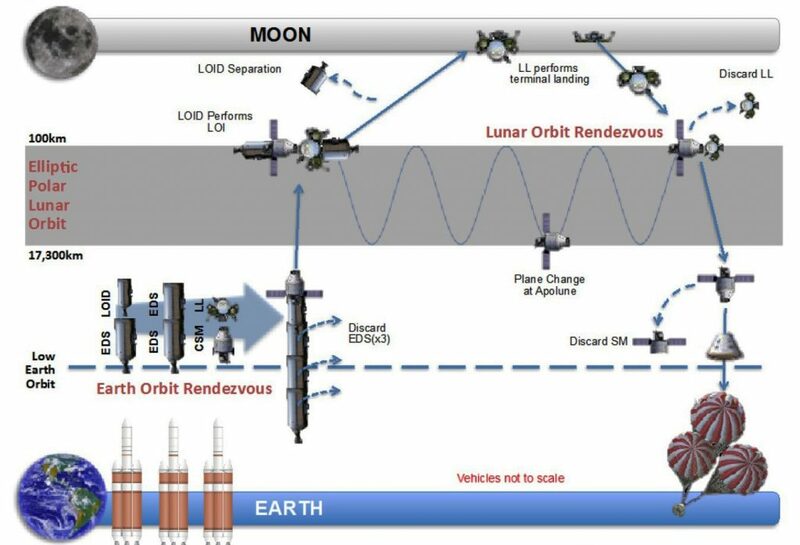 The study focused on using the basic Apollo architecture of a command and service module (CSM) to launch from and return to Earth, connected to a lunar module (LM) to go to and from the lunar surface with modifications made possible by current technology. Technology upgrades to the lunar lander included higher efficiency propellants, lightweight materials for the structure, and state-of-the-art electronics for computing, avionics, and communications. The electronics provide “on the order of a billion-fold increase in terms of reduced power consumption and increased computing capability,” the students said. They also replaced the Apollo-era batteries with modern fuel cells that produce water as a useful byproduct. One problem with switching to cryogenic fuels for the Human Architecture for Lunar Operations (HALOs) lander is that the fuel tanks, which are between the descent engines and the crew cabin, are, like the space shuttle external tank, enormous. The students noted, “This makes surface operations very difficult because it puts the crew habitat and the ascent stage and payload really high above the surface.” So the young engineers asked, “What if you didn’t have to land on top of the descent stage?” Why not eject the descent stage a few kilometers above the surface and finish the landing with the ascent stage? They found the cost in propellant is minimal, and the two-ton descent stage provides the bonus of a fresh impact crater for study about 5 km (3 mi) from the HALOs lander. Next, the students looked at landing constraints. “All of the Apollo landing sites were on the Nearside and in the equatorial region,” the students said. “If we want to get some increased return out of a future landing program, it wouldn’t really make sense to go back to all those same spots.” But, “to reach high-latitude sites near the pole requires a lot of plane change to come in from Earth and return to Earth,” they said. Because these elliptical orbits are so efficient, using them can save 30-50 percent of launch mass compared to not using them. However, “We don’t have a single launch vehicle that can launch a monolithic Earth departure stage to take this much mass to the Moon,” the students said. “So you have to lift the system in several pieces and assemble them in Earth orbit.” They assumed one Delta 4 Heavy and two Falcon Heavies, and used a SpaceX Dragon capsule for the CSM. The different parts would then be assembled after an Earth orbit rendezvous (EOM), something that has become a routine part of space station operations. Unlike Apollo, all three crewmembers would land. How long they stay depends on how much luggage they bring, and how many souvenirs they take home. “If you want to do a seven-day surface mission, you can bring a payload with you to the surface of over 2,000 kg (4,400 lbs) and return 350 kg (770 lbs),” the students said. The total mission from launch to landing would last about two weeks. “For a 14-day surface stay, you can bring just over 1,000 kg (2,200 lbs) to the surface and return 700 kg (1,500 lbs) back to Earth.” The increased sample return is based on the steady collection rate of 50 kg/day (110 lbs/day). The total mission duration would be about three weeks. Luggage might include an Apollo rover at 210 kg (460 lbs) with an 8 km (5 mi) range, or a souped-up Constellation pressurized chariot at 1,000 kg (2,200 lbs) with a 100 km (62 mi) range. An Apollo lunar surface experiment package (ALSEP) would take up 166 kg (365 lbs). After lunar surface operations, the LM rendezvous with the CSM for return to Earth. (As in Apollo, the LM is discarded after use, but the students said future studies could examine the possibility of reusing the LM by “parking it at a gravitational semi-stable point such as L2.) The CSM parachutes into the ocean like the Apollo capsules did. 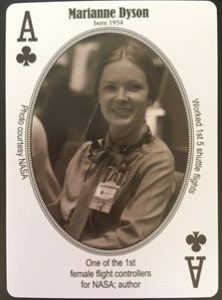 Perfect stocking stuffer that benefits the International Women in Aviation and Space Museum: Women in Aviation and Space Playing Cards! Yours truly is the Ace of Clubs. For high school and up, give a positive vision of the future, a gift membership in the National Space Society. Read my article, “Chinese Planetary Exploration Plans” in the 2018-4 (current) issue of Ad Astra magazine. For future astronauts and lunar pioneers, get a copy of To the Moon and Back: My Apollo 11 Adventure, a pop-up book coauthored with Buzz Aldrin with art by Bruce Foster, and 2017 Best STEM Book, Welcome to Mars: Making a Home on the Red Planet. For middle school and up, consider a gift print or electronic subscription to Analog Science Fiction magazine. My science fact article, “In Defense of the Planet,” is in the Nov/Dec 2018 issue. Also consider a copy of my stories, most previously published in Analog, Fly Me to the Moon. No spacecraft has ever landed on the lunar far side. The only human-made object on the far side currently is NASA’s Ranger 4 that crashed east of Korolev crater (about 15 degrees south of the equator) in April 1962. But that is about to change! If all goes well this December, the Chinese Chang’E-4 (named after a mythological Moon goddess) will earn the title of first to the far side. This spacecraft is a lander/rover combination similar to the impressive 2013 Chinese lunar mission called Chang’E-3. 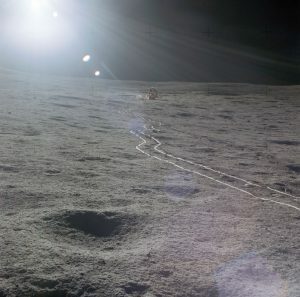 Its Yutu (rabbit) rover successfully explored the Bay of Rainbows (Moon’s left “eyebrow”) and returned exciting new scientific data about the lunar surface and subsurface. The far side of the Moon is never visible from Earth, making direct communications impossible. Therefore, to communicate with the spacecraft and rover on the surface, the Chinese deployed a relay satellite called Queqia (meaning “magpie bridge” from Chinese folklore) earlier this year. Since June, it has been in a 28-day orbit around the Earth-Moon L2 Lagrange point, which is about 37,000 miles (60,000 kilometers) beyond the Moon. 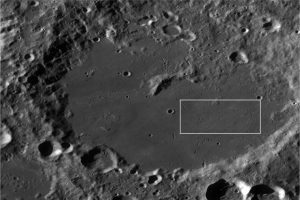 The floor of Von Kármán crater was selected because it is relatively flat, with no more than about 197 feet (60 meters) of elevation change in topography. The rover will map the thickness of the regolith (lunar soil) in this area, which should help researchers to date the age of Von Kármán’s formation and anchor a geological timeline for much of the lunar far side. Several countries, though not the United States, are actively involved in Chang’E-4. Germany is providing a lunar neutron and radiation dose detector for the lander, Sweden is contributing a neutral atom detector for the rover, and the Netherlands provided a low-frequency radio spectrometer for the Queqia relay satellite. Dr. Jun Huang of the Planetary Sciences Institute, China University of Geosciences in Wuhan noted that one of the public education experiments on the lander will concern studying a tiny ecosystem including vegetables and worms. These items will be the first non-human living things (other than bacteria left behind on spacecraft) to reach the surface of the Moon. But perhaps the most exciting thing about this first exploration of the lunar far side is that the Chinese have embarked on a well-planned step-by-step approach to building space capabilities that will directly lead to human space settlements. After Chang’E-4 comes Chang’E-5, an ambitious lunar sample return. After that, they will use robotic missions to further explore the lunar far side south polar region. Their 10-year plan, which they have followed very closely, has these missions launching in 2023 with humans arriving as soon as 2030. While NASA’s attention is focused on space stations in high lunar orbits, the Chinese may become not only the first to land a spacecraft on the far side, but humans, too. My article, “Chinese Planetary Exploration Plans” with more detail about the Chinese space program is in the 2018-4 (current) issue of Ad Astra magazine. To get your copy, join NSS! 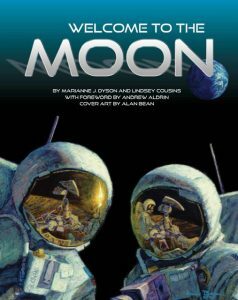 To the Moon and Back: My Apollo 11 Adventure, a pop-up book coauthored with Buzz Aldrin with art by Bruce Foster, is available for now from Amazon. Get one for all the kids, big and small, in your family! My science fact article, “In Defense of the Planet,” is in the Nov/Dec 2018 issue of Analog. Paper or eBook subscriptions available. 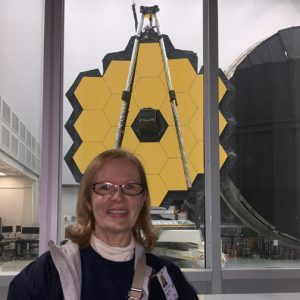 Recently NASA announced the first woman, Holly Ridings, to be selected as Chief of the Flight Director’s Office. Flight directors lead the team of flight controllers in Mission Control. The Chief Flight Director is their boss. To reach this position, a person must demonstrate a high level of integrity: like Randy Stone (1944-2013) who similarly rose up from flight controller to flight director to chief flight director (and eventually led Mission Operations). I’d like to share his story via an excerpt from my memoir. Diane [Freeman] and I were on the Ascent, or Silver Team, for STS-1. Our Flight Director was Neil Hutchinson who expected only the best and no excuses. And well he should. If something were going to break, it’d most likely happen during the dynamic ascent phase. We filed out of the auditorium quietly, each of us lost in thought. No one had ever flown such an unwieldy vehicle, an airplane with stubby little wings strapped to a giant tank with rockets bolted onto the sides. Did we really know what we were doing? Apparently, Mr. Kranz felt that we did, as much as anyone could in a test program. After all, if we knew everything about how this vehicle would fly, we wouldn’t need test flights. He’d expressed the ultimate confidence in us without any false pretenses. He’d sat in on all the long sims. He’d seen us wrestle with failures and find ways to work around them. He knew every one of us by name–had questioned us in briefings, in meetings, and seen us let off steam at social events. He trusted us to do everything humanly possible to prevent or mitigate the consequences of any failures. Even though I was just a lowly Timeline 2, I felt an immense responsibility to justify Mr. Kranz’s confidence in me. This was no game or simulation. Two men I’d worked with for more than two years were going to eat steak and eggs for breakfast, suit up, and climb aboard the Space Shuttle Columbia. The procedures I’d written for transitioning the computers, for opening the payload bay doors, for what to do if the FES [Flash Evaporator System] or Freon loops, or the primary computers failed, were stowed onboard. My name was on the inside cover of those books. Though others had reviewed and approved them, I felt responsible for those procedures. Like in football games where the clock is stopped for time-outs, the countdown clock stops at certain times in the prelaunch preparations while controllers check data. During the hold at T-2 hours and 4 minutes, Young and Crippen were strapped into their ejection seats. If anything happened during the launch or the latter part of entry (below about 100,000 feet), those seats would blow them out of the cockpit. This capability was only available during the first four test flights and was the reason the crew size was limited to two astronauts. Even though the Launch Control Center at Kennedy was in charge until the vehicle cleared the launch tower, Houston Flight had to give a “go” for the launch to occur. Hutchinson wouldn’t give that go unless he got a go from each member of the Silver Team. The countdown proceeded until the T-20-minute hold. Everything was going great, and we all refreshed our coffee and made final trips to the restroom. By now the countdown had progressed to T-9-minutes and was on hold for ten minutes. The weather was beautiful. The astronauts were strapped in and ready. Hundreds of thousands of people, including politicians and celebrities, were waiting and watching. And so was Mr. Kranz who’d reminded us all of the seriousness of our responsibilities. The decision rested heavily on Stone’s shoulders. While he contemplated the computer issues, one of the fuel cells showed abnormal acid levels. The countdown was halted. The fuel cell was quickly determined to be okay, and the countdown was set to resume after the hold. When we came out of the hold, the computers still didn’t match up. But even if they had, Stone had already made his decision, and so had Hutchinson. Would the managers support this decision to scrub the launch? It was an expensive choice. The eyes of the world were on us, and the launch had been slipped again and again. But a flight controller had trusted his training and made a difficult call, knowing that even worse consequences might have resulted if he hadn’t. The team at KSC and in Houston worked for three hours unsuccessfully to trace the source of the computer problem. Finally, the Launch Director halted the countdown clock and declared a scrub at just before 10 a. m. Young and Crippen, who had been lying on their backs for six hours, were helped out of the cockpit. We soon learned that the problem with the computers was a timing error that caused them not to sync up with the backup machine. …. IBM fixed the flaw in the software after the first flight so it couldn’t happen again. So please join me in congratulating Holly Ridings on her selection as Chief of the Flight Directors Office. She is an inspiration to all. To the Moon and Back: My Apollo 11 Adventure, a pop-up book from National Geographic that I coauthored with Buzz Aldrin, with art by Bruce Foster, is available for order now from Amazon. Look for it in stores everywhere on October 16. My science fact article, “In Defense of the Planet,” is in the Nov/Dec 2018 issue of Analog. Get your subscription now! Teachers, librarians, and event organizers, please consider me for Author Visits. Writers and publishers, I offer science consulting, content and technical editing. October 2, Instructor for first class of Women and Space course at Rice University’s Glasscock School of Continuing Studies. October 12, Featured speaker on Friday 11 to noon, book signing 12-12:30 at the NatGeo Cengage Booth #408 at the National Science Teachers Association conference in Reno, Nevada. October 27, Saturday, 10-2. Free & Open to the Public: NASA Johnson Space Center Open House. Look for copies of To the Moon and Back at the JSC Employees Exchange Store either at the tent by the Saturn V or in Building 3 cafeteria. Visible in the evening starting this month, the two brightest stars of Orion are showing off their colors. But red Betelgeuse (Orion’s left shoulder, pronounced “beetle-juice”) and blue Rigel (Orion’s right foot, pronounced “rye-gel”) are destined to produce truly spectacular performances in the future. People used to think that all stars are about the same size. Therefore, stars that appeared brighter must be closer like flashlights near versus farther away. Betelgeuse is very obviously a different color than most stars. Human eyes see it as orangish red whereas Rigel looks blue. These colors aren’t just pretty, they reveal the temperature of the star. Human eyes are good at judging heat output by color. Anyone who has ever roasted a marshmallow quickly discovers that a blue flame will burn it to a crisp whereas a warm yellow fire or a set of red embers will slowly brown it. Thankfully, we don’t have to hold marshmallows up to various stars to prove some are hotter than others. Scientists have quantified the colors by wavelengths so all we have to do is look at their spectra to tell precisely how hot stars are. Why is Betelgeuse so cool? The temperature of a star depends mostly on its mass and age. Stars form by gravity pulling gas into a ball until it is hot enough to start nuclear reactions. The rate of those reactions, and thus how hot the star gets, depends on how much gas ends up in the ball. Blue Rigel is 20 times more massive than our yellow sun. But what about Betelgeuse? It’s red, so does that mean it’s smaller than the Sun? Nope. There are two kinds of red stars: “adult” main sequence stars (which are the most common of all stars), and red giants in their final days. Betelgeuse has almost as much mass as Rigel. It is red because it is dying. As stars use up their hydrogen fuel, the centers contract, and the outer layers expand out and cool. The stars become giant red puff balls regardless of what color they started out. In about 5 billion years, the Sun will become one of these red giants, expanding out past the orbit of Venus and toasting Earth’s marshmallow. It only took Betelgeuse about 10 million years to reach the giant, or in this case, supergiant, phase. Because of its huge mass, Rigel will become a red supergiant too, likely in the next few million years. The red giant stage is a relatively short period of a star’s life, which is why there are so few visible in the sky. The red giant stage is followed by a final collapse of the center of the star as it runs out of fuel and can’t push back against gravity’s squeeze. For small and average stars, the collapse produces a white (hot) dwarf star about the size of Earth. Big stars like Betelgeuse and Rigel collapse violently, producing supernovas and leaving behind pulsars or black holes. Astronomers estimate that Betelgeuse’s supernova will outshine a full Moon when it happens: which could be tomorrow or a million years from now. 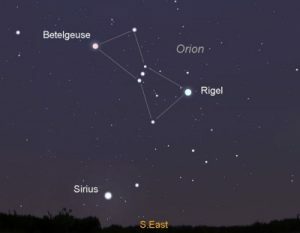 So while enjoying the colorful “preview” show of Orion this fall, have fun thinking about how this constellation will look when Betelgeuse “moons” the sky and Rigel blushes red! 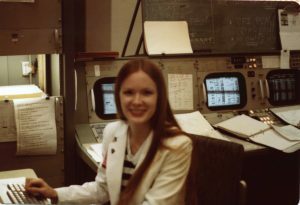 An excerpt of my memoir, A Passion for Space, describing my experiences as a flight controller during the first space shuttle launch, will be included in the FenCon 2018 Program Book this September. Attend to get your copy! My next book, coauthored with Buzz Aldrin, To the Moon and Back: My Apollo 11 Adventure, a pop-up book from National Geographic with art by Bruce Foster, is available for preorder now from Amazon. Look for it in stores everywhere on October 16. September 21-23, Science GOH at FenCon XV in Dallas. Writer GOH is Larry Niven. Tickets are available at the door. September 29, Attending SCBWI Houston conference. Come and get a special pop-up book mark for To the Moon and Back designed by artist Bruce Foster. October 12, Featured speaker on Friday 11 to noon at the National Science Teachers Association conference in Reno, Nevada. See my contact page for a complete appearance schedule and photos from previous events. With no air in space, lungs empty like popped balloons. Blood boils, turning people into giant bruises. Eyes pop and eardrums burst. Yuck! People must have air. We need it to breathe, and we need its pressure on us so air and liquids inside us don’t escape. We also need the right mix of gases to stay healthy and avoid fires in space. Providing clean spacecraft air for a three-year round trip to Mars is quite a challenge, but one we are learning how to meet thanks to the experience gained on the International Space Station. To help others (especially you science fiction writers out there!) understand and appreciate that there is more to the life support system than worrying about the Klingons causing a hull breach, I’m sharing a slightly edited excerpt from my children’s book, Space Station Science (which you can order via Amazon or my website). At the beginning of the space program, NASA filled spaceships with pure oxygen—the only gas people need to breathe. But during an Apollo 1 training session, the 100 percent oxygen atmosphere caused a fire to spread so fast that the three-man crew was killed in a matter of seconds. After that tragedy, NASA began mixing the oxygen with nitrogen during ground tests. Nitrogen slows fires, and people are used to breathing nitrogen and oxygen because natural air is four parts nitrogen to one part oxygen. Station modules are launched with natural air inside. This air quickly grows stale and gradually escapes. It must be replaced. The nitrogen and oxygen for space station air are hauled to space from Earth. In order to fit in smaller tanks, these gases are chilled into liquids. The liquids are warmed to gas again before being released into the modules. The Russians use a system called Elektron to turn wastewater into oxygen. Water is about 90 percent oxygen by weight. Electricity separates the water into hydrogen and oxygen. The oxygen goes into the cabin. Hydrogen is dangerous. A leak into the cabin could cause an explosion. Therefore the hydrogen is vented overboard. Oxygen and nitrogen are stored in tanks in the Progress resupply ships or mounted outside the air lock. Tank valves open like little doors, “inflating” the station when the air pressure inside drops below a certain level. When guests visit, more fresh air is needed. But astronauts can’t open a window to get it. When the space shuttle visited, hoses with air holes were snaked through the tunnels and hatches. The hoses transferred oxygen from the shuttle’s cabin to the station’s modules. Just before a shuttle departed, it “puffed up” the station with an extra shot of air. The Russian Soyuz, a much smaller vehicle, does not carry extra air like the space shuttles did. When it brings visitors to the station, the Russians use portable solid fuel oxygen generators to provide the extra air needed. These generators were first developed for submarines and were used on the Mir space station. Like portable heaters, each generator sits in the aisle of a module. Cosmonauts insert a chemical candle that “smokes” oxygen for 5 to 20 minutes. These generators get very hot, and twice started fires on Mir. The crew were not hurt either time, but because of the risk, the generators are used only during visits and as a backup system on the station. Replacing oxygen and nitrogen is not enough. People breathe in oxygen but breathe out carbon dioxide. Carbon dioxide is poisonous. It can cause sickness and death even if there is enough oxygen in the air with it. On Earth, plants absorb it. In space, chemicals do the job. Space suits use canisters of a chemical called lithium hydroxide to absorb carbon dioxide. 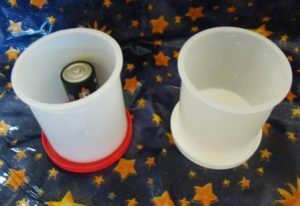 The space shuttles also used these canisters. Like a litter box used by many cats, these canisters must be changed often. New ones must be stored and full ones thrown away. Enough canisters to supply the station between cargo supply visits would fill an entire module. So the station has a reusable air-scrubbing system. The Russian system is called Vozdukh, and the American one is called the Carbon Dioxide Removal Assembly (CDRA, pronounced see-drah). 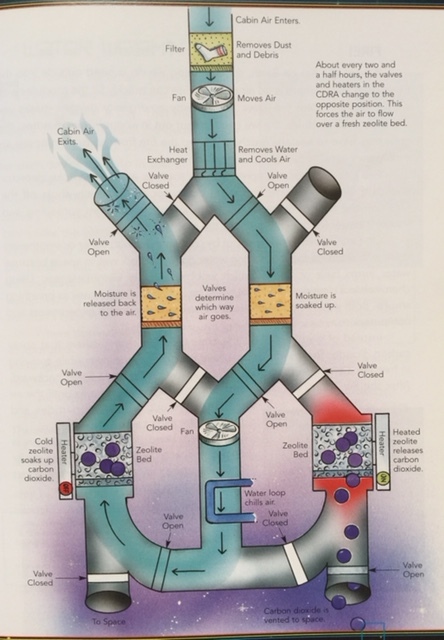 Air Filtration System Diagram: About every 2.5 hours, the valves and heaters in the CDRA change to the opposite position. This forces the air to flow over a fresh zeolite bed. Diagram by Dave Klug from page 27, Space Station Science, © Marianne Dyson. With no up and down, hot air does not rise. So station fans constantly stir it. Dust and debris collect on fan screens and filters. After filtering, the fans blow the station’s air across beds of a chemical called zeolite, which is often used in fertilizers. The carbon dioxide in the air sticks to the zeolite while the oxygen and nitrogen sail on through. When a zeolite bed gets “soaked” with carbon dioxide, the airflow to it is shut off. The bed is heated, releasing the carbon dioxide overboard. 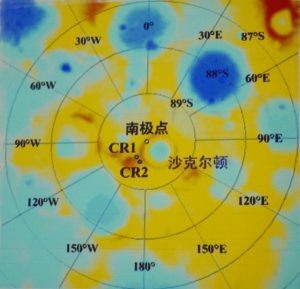 Once all the carbon dioxide is gone, the zeolite bed is cooled, the airflow is turned back on, and the cycle starts over again. Note: maintaining the CDRA system has proven quite challenging for space station astronauts as described in Scott Kelly’s book, Endurance, which I highly recommend. Water vapor from breathing, washing, and sweating also must be removed from the air. Otherwise, it fogs windows and allows mold to grow. What combination of systems will astronauts headed to Mars use to keep their air fresh and clean? Whatever systems are chosen, they must operate for the entire time that astronauts are away from Earth—about three years for a round trip to Mars. The Callahan Kids: Tales of Life on Mars is going out of print at the end of August. The stories are forever, but the company that sponsored the anthology which has two of my stories (“Martian Mice” and “Dropping the Martian Ball”) has gone out of business. The eBook book targeted at upper elementary and middle-school kids is now only 99 cents on Amazon. The print book is $9.99 on Amazon, but only $9.00 if you use my coupon code via CreateSpace. See my Book Orders page right-hand column for the code. You may also order a signed copy from me through my website. 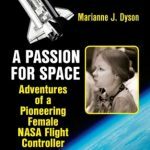 An excerpt of my memoir, A Passion for Space, describing my experiences as a flight controller during the first space shuttle launch, will be included in the FenCon 2018 Program Book this September. Register to attend to get your copy! September 29, Attending SCBWI Houston conference. Come and get a special pop-up book mark for To the Moon and Back from artist Bruce Foster. At the end of July, Mars will be its brightest in 15 years because it will be only 35.8 million miles (57.6 million kilometers) away. Since no one has ever been to Mars, how do we know this distance so precisely? Half the distance (R in the diagram) between two locations on Earth is the known (opposite) side of the parallax triangle. One angle is 90 degrees. The other angle is found by observing the object from the two locations (Cassini in Paris and fellow astronomer Jean Richer in French Guiana in 1673). From the two locations (1 and 2 in the diagram), the object appears in a slightly different place in the sky (A and B in diagram) defined by the distant background stars. The difference in position reveals the angle (ɵ in the diagram). Plugging the known distance and measured angle into the tangent equation*, the answer for D is revealed. The distance (D) to a planet or star can be found by observing it from two locations (1 & 2) whose separation (R) is known, and then determining the angle (ɵ) between the observed position in the sky using distant background stars (A and B). Credit: NASA. *The tangent of ɵ equals the length of the opposite side (R) divided by the length of the adjacent side (D) which is the distance. Because the angle is very small, the tangent is approximately equal to the angle. So the equation simplifies to D (in parsecs) equals R (in Astronomical Units) divided by ɵ (in arc seconds). The farther away an object is, the “taller” the triangle and the smaller the angle, making it difficult to measure very accurately. 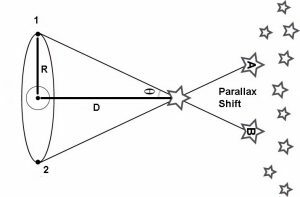 Thus parallax measurements to planets are easier when the planet is at opposition, on the same side of the sun as Earth. Mars opposition occurs every 26 months. But the orbit of Mars is an ellipse. So the closest to Earth Mars can get is when opposition is near periapsis—when Mars is closest to the sun. Opposition and periapsis coincide every 15 years, and 2018 is one of those years. The years when opposition and periapsis coincide are also the best years, in terms of fuel and time spent in transit, to send spacecraft to Mars. Back in 1990, I wrote a science fiction story about a group of astronauts preparing for a trip to Mars this year so that they would take the first steps on Mars before the 50th anniversary of Apollo 11’s landing on the Moon. I rediscovered this manuscript (it was not in digital form!) in my closet recently and am in the process of turning it into an alternate history novel. So when I go out to view Mars later this month, I’ll be imagining my crew on their way there this summer. If they had followed the trajectory of InSight that launched on May 5, they’d be arriving on Mars on Monday, November 26. [Ref: Planetary Society.] But to reduce radiation exposure, they would likely have launched on May 18, “passed” InSight en route, and would be arriving on Mars on September 10, 2018. Would that day become a holiday on Mars? Imagine if the current crew of six (which includes only one woman) up on the International Space Station were instead on their way to Mars. Would they be worried about the global Martian dust storm in progress right now? Would every kid in the country know everything there is to know about their planned landing area in Isidis Planitia? I can almost hear my young self proudly telling my mom that this part of Mars was named after the Egyptian goddess of heaven and fertility. Though no humans are yet scheduled to travel to Mars, at least we have learned how to measure the distance and send spacecraft there. InSight is a pretty cool little spacecraft, too. It has a probe that is a self-hammering mechanism that will pound itself into the ground, up to 16 feet (5 meters). It relays data back via its tether to the lander. What might it find under the surface? So later this month, look for Mars in the southeast evening sky near the Sagittarius “teapot.” Mars will be glowing orange below and to the left of the teapot with yellow Saturn above the top. Saturn was at opposition on June 27. How far is it to Saturn? If you have a good telescope, and a friend on the other side of the planet, you can figure it out yourself using triangles. Or you can just Google the answer! My guest editorial on Gender Parity is in the July/August issue of Analog. You can read it free online, but you might want to subscribe so you can read my fact article “In Defense of the Planet” in the upcoming Nov/Dec issue. I also did a Q&A with the magazine that should be posted later this month on the Astounding Analog Companion. My next book, coauthored with Buzz Aldrin, To the Moon and Back: My Apollo 11 Adventure, a pop-up book from National Geographic, is available for preorder now from Amazon. Look for it in stores in October. I offer programs for school-aged children up through senior citizens, as well as science workshops for students and teachers. Please consider me for Author Visits. September 29, Attending SCBWI Houston conference. October 12, Featured speaker on Friday at noon at the National Science Teachers Association conference in Reno, Nevada. 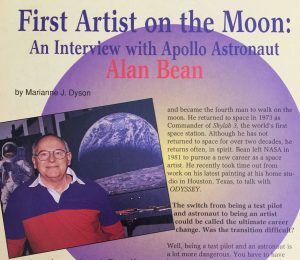 Apollo 12 Astronaut and Artist Alan Bean who died on May 26, 2018, kindly granted an interview to this former flight controller who was considering a new career as a children’s writer back in 1994. After all these years, I find his words still inspiring, and I hope you will also. 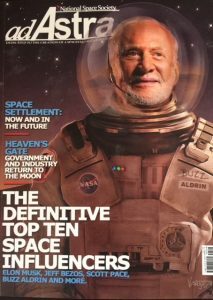 The May 1994 issue of Odyssey Magazine included my interview and photo of Alan Bean. Photo ©Marianne Dyson. As a boy growing up in Texas, Alan Bean fell in love with flying. He built precise model planes and hung them from the ceiling of his room, “like birds dressed up for a party in shiny decals and brightly colored paints.” Through a determination to always do his best, Bean became a Navy pilot and then a NASA astronaut. In November 1969, he stepped out of the Apollo 12 lunar module and became the fourth man to walk on the moon. He returned to space in 1973 as Commander of Skylab 3, the world’s first space station. Although he has not returned to space for over two decades, he returns often, in spirit. 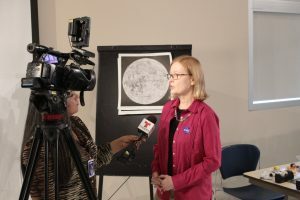 Bean left NASA in 1981 to pursue a new career as a space artist. He recently took out from work on his latest painting at his home studio in Houston, Texas, to talk with ODYSSEY. The switch from being a test pilot and astronaut to being an artist could be called the ultimate career change. Was the transition difficult? Well, being a test pilot and an astronaut is a lot more dangerous. You have to have intense training and a certain personality and work habits to be successful and survive. That’s not the case in art, where anyone can create what they feel is art. However, it takes longer to be a good artist. It took me about six years from the time I became an astronaut until I felt I was a really good astronaut. It’s taken me 12 years until I felt I was a really good artist. You’ve ridden rockets to the moon and walked in space and received all kinds of recognition and awards for those achievements—how do those thrills compare to the rewards you get as an artist? They’re really about the same. I think the feeling of a job well done on a daily basis, no matter what the job is, is one of the most important things that a person can feel to have a happy life. Awards come from time to time, but effort comes on a daily basis. I have heard that there is real moon dust in your paintings. Is that true? I wanted to put moondust in them, but I didn’t have any moon rocks; the government has all of those. But one day I realized NASA gave me the patches from my suit—the NASA patch, the American flag, the Apollo 12 patch. They were dirty with moondust, so not I cut up those patches into little bits and I sprinkle them around in the paintings. There are minute quantities [of the patches and moondust] in all of them. Which painters that ODYSSEY readers might be familiar with have influenced your work? American painters Charles Russell and Frederick Remington have inspired me. French artist Claude Monet is my favorite artist. When you look at Remington’s and Russell’s paintings, you can figure out the story they’re telling of a frontier and adventures that occurred on it. If I want to tell the story of this [space] frontier, I’ve go to be able to paint my spaceships as well as they painted their horses; I’ve got to be able to paint my astronauts as well as they painted cowboys and Indians. Now, Moment doesn’t tell stories as well, but he does things that are beautiful to look at. I try to combine some of Remington’s and Russell’s storytelling and realism with some of Monet’s color variety and beauty in my work. Imagine that in 50 years, you’re still alive and our nation builds an art museum on the moon. What would you say if people ask to name it after you? I’d say it would be very appropriate because I am the first artist to have painted the moon. Maybe some day they will have an art museum on the moon, and I hope they have a painting or two of mine in there. I’ve never really thought about it. But I think someday it will happen. 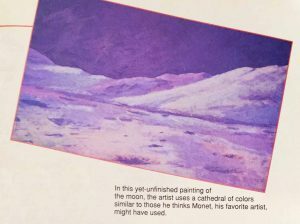 In the yet-unfinished [in May 1994] painting of the moon, the artist [Alan Bean] uses a cathedral of colors similar to those he thinks Monet, his favorite artist, might have used. Photo ©Marianne Dyson shown as published in Odyssey Magazine. beyond the pallid dawn of history. and paint its hills with hues of future sight. with fingerprints of God in lunar gray. Analog readers, watch for my guest editorial on Gender Parity in the July/August issue. After a talk with students at Laredo Public Library on May 15, 2018, I was interviewed by Telemundo TV. The clip aired during the local evening news. Photo by Rick Carrillo. Many people mistakenly think that there is no gravity in space, and thus all that’s needed to reach space is to attain a certain altitude. But this is NOT true! Earth’s gravity at the surface is defined as 1g. A simple calculation* shows that the gravity at 200 miles (320 km) altitude is 90 percent of what it is on the surface, or 0.9g. The reason spacecraft stay in orbit is not because there isn’t any gravity, but because they have attained the speed necessary to balance gravity’s pull. They must go up high enough to avoid running into mountains and the upper atmosphere which would slow them down. To drop to a lower orbit or return to Earth, a spacecraft doesn’t just “step off” a platform in the sky: it must slow down. This happens naturally over time because, though thin, the Earth’s atmosphere extends far into space. This is what happened to Skylab and more recently, to the Chinese space station. To stay in orbit, spacecraft must be periodically boosted. The key to a safe return from space is to slow down, and slow down gradually. Slowing down begins by flipping the spacecraft so that the engines are pointed forward, into the direction of travel. To slow down completely would require about the same amount of fuel as it took to reach orbital speed in the first place. On an airless world like the Moon, that is the only way to slow down. But because of Earth’s atmosphere, spacecraft need only fire their engines enough to slip into the atmosphere and then let friction do the rest. The space shuttle orbiter was covered with tiles to insulate the aluminum skin underneath from the high temperatures produced by the friction of passing through the Earth’s atmosphere at high speeds. Image: Lockheed Martin. Once the spacecraft has passed through the upper atmosphere and lost much of its speed to heat, it is still going very fast. Unless it slows down more, it will hit the surface like a speeding car crashing into a wall. 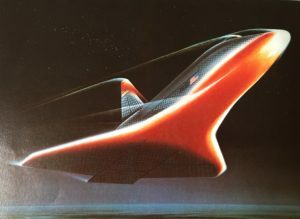 To slow down further, winged craft like the space shuttle increase their time in the lower atmosphere by executing “S” turns and then deploying parachutes after touchdown. Capsules like the Russian Soyuz use parachutes while still in the air and fire retrorockets just before touchdown. So when it comes time to return to Earth from your trip in space, remember to slow down! Prove that heavy objects do NOT fall faster than light ones, but compact objects DO. Take two identical plastic containers with lids. Put a flashlight battery in one. Seal and drop them both. They hit the floor at the same time. Then take two identical sheets of paper. Crumple one and leave the other flat. Drop them. The compact one hits first. If you did this experiment on the Moon, they would strike at the same time. (Watch an Apollo demonstration.) The speed of falling does not depend on mass. In an atmosphere, objects with more surface area fall more slowly than compact objects. *The equation for gravity is g=G x M/D² where G is a constant, M is mass, and D is the distance. GM/D² for the surface divided by GM/D² for 200 miles up ends up with all terms except D cancelling out, i.e. 4000×4000/4200×4200=0.9. **For calculating orbital velocity (v=√GM/r) see Gravitation Calculating Orbital Velocity of a Satellite, Step-by-Step Science. I was inducted into the Nevada Space Center Hall of Fame on May 5, 2018. 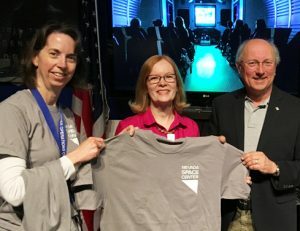 Prior to the evening event, I received a T-shirt from Challenger Center Flight Director Jenny McFarlane and former NASA Flight Director Paul Dye. Photo: Nevada Space Center. Saturday, May 12, 1:00-4:30 PM. Speaking on “How to Publish a Book” at Houston Writers House. Event sold out, but watch for another session to be scheduled.